Tooro Queen Mother Best Kemigisa has been put on the spot for allegedly grabbing vast properties belonging to the kingdom’s royal family members. A document tabled before the Justice Catherine Bamugemereire land probe commission, accuses Kemigisa of having acquired letters of administration with three other people, which she used to own and administer the estate of the family. This was after the death of her husband the former King of Tooro Patrick Mathew Olimi Kaboyo III, who died in August 1995. The documents also indicate that the late Kaboyo acquired proprietorship of his late father George David Kamurasi’s estate as the heir during the political turmoil that led to abolition of monarchies in 1966. Appearing before the commission sitting at the National Archives and Records Center in Wandegeya, the family members, led by Prince Gilbert Atwooki Mujogya and Princesses Damali Kankya, revealed that the late King Kaboyo acquired proprietorship of the property as a trustee during an emergency upon the death of their father Kamurasi. They also said that the late Kaboyo died intestate before reverting land to its rightful owners. “As a tradition, the King left a Will and appointed guardians of his 27 children but those who were of age (above 18 years). For us who were younger, we were subjected to the trusteeship of Kaboyo by way of a certificate of succession,” testified Prince Mujogya adding that their late brother Kaboyo had kept their share as per the tradition like the late Kamurasi. They claim that Kemigisa, after the death of their brother, went and acquired letters of administration as a sole administrator of the estate in 1999. This formed basis for transfer of the land into her names and subsequent sale. Prince Mujogya testified that Ms Kemigisa sold their property in contravention of her own declaration that she made before court to properly administer and account for the estate of the deceased King. “We approached the queen mother with all the facts to have the land transferred to the rightful owners but she refused all these years. Our uncle and aunt wrote to her in vain,” said Mugoya, a retired Geological engineer. According to Prince Mujogya, family elders; Agnes Bagaaya and Switzer Kaijamurubi wrote to the queen mother in a confidential letter about the complaint by the Kamurasi children over the property they inherited and asked her to return the same in vain. Mujogya added that Kemigisa has remained totally adamant to recognize the beneficial interests of the royal children of King Kamurasi. “She (Kemigisa) has even gone to the extent of selling these portions of land. She has sold to government, 13 parcels of land in various parts of the Kingdom which was supposed to be administered by the administrators of Rukidi Estate,” said Mr Mujogya, also accusing the registrar of titles in Fort Portal, only identified as Mr Mpaka of declining to register caveats on the disputed land. He said that efforts by the administrators of Rukidi estate to lodge caveats on the disputed land at Rukani, Buteerwa, Kitojo were frustrated by then registrar only identified as Mr Mpaka who is accused of declining their plea in April 2002 upon learning of the impending sale of their land. Mujogya said some of the land sold includes cultural sites like burial grounds of forefathers at Kagoma and Burongo and that issues regarding their property have not been resolved due to the unresponsive nature of the Queen mother, while part of it was sold to Asians. 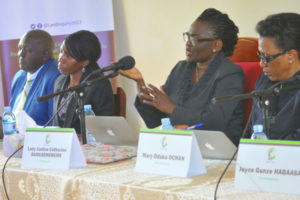 Mujogya testified that the former chairman of the Uganda Land Commission, the late Mayanja Nkangi authorised the survey of the disputed land without the consent and consultation of the princes and princesses of the royal family. He said that denial of entitlement of their property has kept the royal family members in abject poverty. “My humble request to the Commission is to seek for intervention to have this matter resolved amicably. We have consulted lawyers and they have advised that we should not go to court because even the Batooro are not happy when they see the state of affairs. It does not come out well when they see the royal family coming out against the Queen mother for stealing their land. We appeal to you my lord to help us have this matter resolved,” said Mujogya. Last year, Tooro elders under their umbrella body, Isaazi Ly’ Abantu Bakuru Ba Tooro from Tooro led by the Fort Portal Municipality MP, Mr Alex Ruhunda, asked the commission to halt all cases of extra-legal evictions and land grabbing. They alleged that in 2003, Ms Kemigisa aided by armed security agencies, conducted a series of land grabbing and evictions of bonafide occupants on land and destroyed property, including houses and crops, around Fort Portal Municipality in Kabarole District. The commission is also inquiring into the effectiveness of relevant bodies in the preservation of wetlands, forests and game reserves and examines ways in which the challenges of human habitation in those areas can be resolved. The Commission heard that in 2008/2009 the Queen mother, as a registered administrator of the estate of the late king of Tooro Kingdom, sold 9,121 acres of land at Kibiito Sub-county in Kabarole District at Shs4.5b which was bought by government using the Land Fund.